The innovation for the MiaMia collection is derived from designing the Alan Hannah collection for the last 25 years. They have brought all their experience to bear on creating this wonderful “younger sister”, MiaMia. As the younger sister, MiaMia is individual and has her own personality, separate from her sibling. MiaMia is strong and forward thinking but takes from the older sisters experience. They have produced a complete collection of dresses inspired by the early part of the 20th Century. This era was full of change and turbulence and with this came vibrancy and dynamism as people in uncertain times still strove for glamour, fun and success. They wanted to create a collection of dresses that are beautifully embellished with exquisite beadwork using sumptuous new fabrics with subtle colour and texture. Shying away from lace They have created a modern vintage collection for brides to wear and enjoy and look back on for ever more. There are timeless pieces and there are fun debutant styles and there has been no expense spared in the sheer quality and cut of this collection. 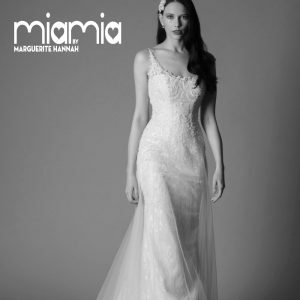 We only have one or two dresses left from our MIA Mia collection so do contact us now before they all go!